In the 1990s the scuba diving community of Sharm el Sheikh discovered an amazingly well-preserved World War II British shipwreck lying 100 feet below the surface of the Egyptian Red Sea. ‘Grandad, I think they’ve found your ship’, was a soon to be heard announcement as the SS Thistlegorm exclusive survivors story began to emerge from the 50 year-old hidden time capsule. SS Thistlegorm was more than just a shipwreck; it held secrets and stories that would captivate and enthrall millions of people for years to come. Grandad was no longer just an ageing relative who ‘Did something during WW2’. The ‘Something’ that these living heroes accomplished was now in national newspapers, magazines and the subject of a full-length BBC television documentary. John Kean’s well-researched book unites SS Thistlegorm’s World War II existence with the present day, bringing together a rich tapestry of personal and often dramatic accounts from a variety of close-to-the-action witnesses. These include surviving crew who were traced and interviewed by the award-winning BBC television producer Caroline Hawkins in 1993. Slowly but surely the survivors of SS Thistlegorm, bombed in 1941, came forward with their incredible accounts of action, adventure, disaster and survival against the most appalling odds of the War. Evading sharks, exploding shells, enemy gunfire and the open sea they made their escape and were rescued by the British Royal Navy. Half a century later SS Thistlegorm was to enjoy a second life as a world-class scuba diving attraction but not before the legendary undersea explorer, Jacques Cousteau, paid it a mysterious visit in 1955. Over the next 40 years only a very small handful of maverick adventurers claimed to have ever seen the hidden shipwreck until a chance discovery in the early 90s opened the floodgates of dive tourism. Today, SS Thistlegorm is widely recognized by scuba divers as the greatest shipwreck in the world not only because of its amazing structure, military cargo and historical significance but for the dozens of heroic, tragic and frequently spectacular stories of survival attached to it. This true story reads like an epic movie with a rich cast of characters that includes British Navy crewmen, German bomber pilots, Egyptian and Israeli boat skippers, undersea adventurers, a bomb disposal veteran and everyday scuba divers making their own visits of exploration to the icon of all shipwrecks. With over 100 images and documents this is a moving and inspiring true story spanning nearly a century and only because of a chance discovery did it ever see the light of day. Read it now and indulge yourself in military and naval history combined with an amazing world of undersea adventure. …Great book, very well written. …A fascinating and illuminating account. …The research that has gone into this book is amazing. …John Kean writes with authority and style. …This book tells a fascinating tale. 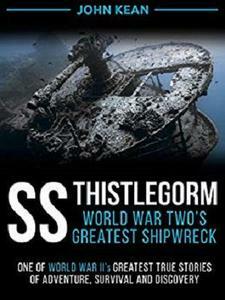 …SS Thistlegorm is a fantastic book. …What more could anyone ever want.